In order to take advantage of iPhone 4 & iPod Touch 4G retina display app developers need to update their apps with high resolution images. Unfortunately many apps in App store are not optimized for retina display leaving blurry app icons on iPhone 4/iPod Touch 4G springboard. To solve this issue, here we are today with yet another useful Cydia App, iRetiner GUI which adds retina display icons to unoptimized appstore apps. The is basically a GUI version of script made by dsx, the script is available in Cydia under the name “iRetiner”. 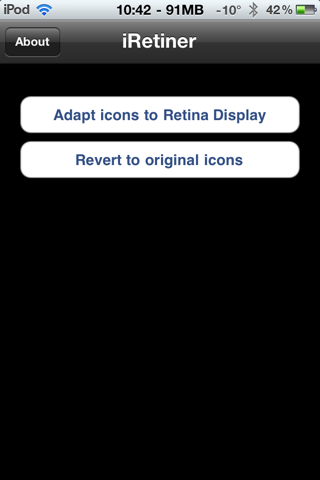 To adapt the icons to retina display, simply click “Adapt icons to Retina Display” (french users : “Mettre les icones en HD”), and to revert them to original, click on “Revert to original icons” (french users : “Restaurer les anciennes icônes”). The application will automatically respring when done. iRetiner GUI is available for download from BibBoss Cydia Repo.